Eggless Mango muffins recipe – moist and fluffy cupcakes made with freshly pureed mangoes and whole wheat flour baked at 180 degrees for just 20 minutes. These simple yet delicious mango cupcakes can be served as an evening snack with a cup of tea ( cardamom tea, ginger tea, etc.,) also as breakfast. During busy weekdays these healthy muffins and a mug of coffee or milk are enough for breakfast. Nowadays, I skip eggs in baking majorly.Eggless versions are favorite for many. I am not sure about shelf time of these eggless mango cupcakes recipe. I didn’t keep it for more than a day. I suggest to make small batches and enjoy as freshly made cupcakes. 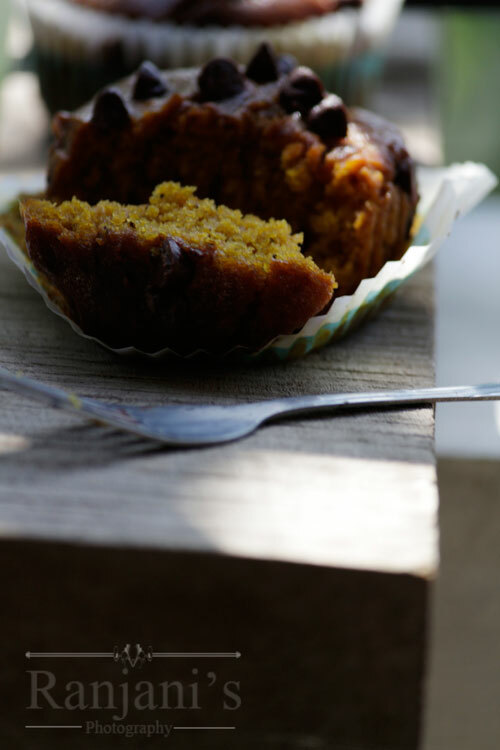 This easy mango muffin recipe will earn kids love whatsoever adults too. You can top with whipping cream of your favourite flavor using a whipping cream dispenser. Take 1 medium sized mango, peel the skin using knife or peeler. Scoop the pulps and grind it to puree. Measure ½ cup and reserve for adding later. Measure ½ cup of whole wheat flour or all purpose flour (maida) in a bowl. Add the dry ingredients baking powder, baking soda, salt and sugar along with the flour. Sieve all the dry ingredients together without any lumps. Now add the wet ingredients mango puree, oil and vanilla essence to the flour mixture. Mix well using spatula or wire whisk. No need to over beat the batter. Gently fold the mixture to incorporate all the ingredients. Once done, add chocolate chips to the batter and mix well. Reserve some chips to add on top of muffins. Now the batter is ready. Take a muffin tray, place muffin liners or paper cups on each mold. Scoop the batter using ice cream scoop or spoon and fill it in a muffin cup. Fill ¾ th of the cup to allow the raising of muffins while baking. 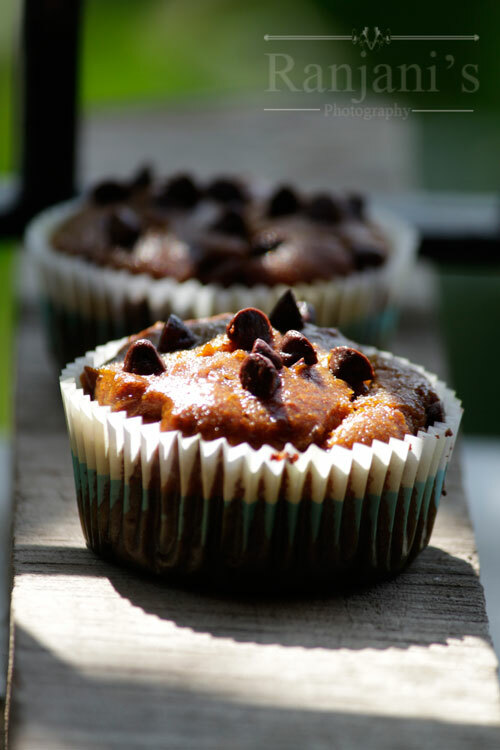 Fill all the molds, spread some chocolate chips on top of muffins and place it in preheated oven. Bake at 180 degrees for 20 to 25 minutes. After 20 minutes, take the muffin tray from oven and check using tooth pick by inserting it at the center. If the tooth pick comes out clean, the cupcakes are done. If some batter sticking on the tooth pick, bake for another 5 to 10 minutes. Remove the muffin tray from oven. Place it on a wire rack for 5 minutes, then unmold the muffins from the tray. Cool down for 15 minutes and serve with coffee or chai. If you are in the sugar free diet, you can replace sugar with jaggery. While using jaggery, you have to soak jaggery in water for 10 to 15 minutes, then filter it to remove impurities before using it in a batter. The addition of chocolate chips is optional. If your love is on nuts, you can add some chopped nuts. Substitute clarified butter (ghee) instead of refined oil. You can also add some aromatic spices like cardamom, nutmeg, or cinnamon. I didn’t add anything. I wanted to relish the real flavor of mango. Preheating the oven is essential. Baking for 20 to 25 minutes is enough. If the cake is not ready, you can bake for another 5 minutes. You can also enjoy these muffins with the topping of whipping cream of your flavor. I suggest mango and vanilla flavored cream works well. Oh my gosh I’m drooling!! These look so good. Yum! I have never tried mango in cupcakes before. They look wonderful and I love how easily they come together. 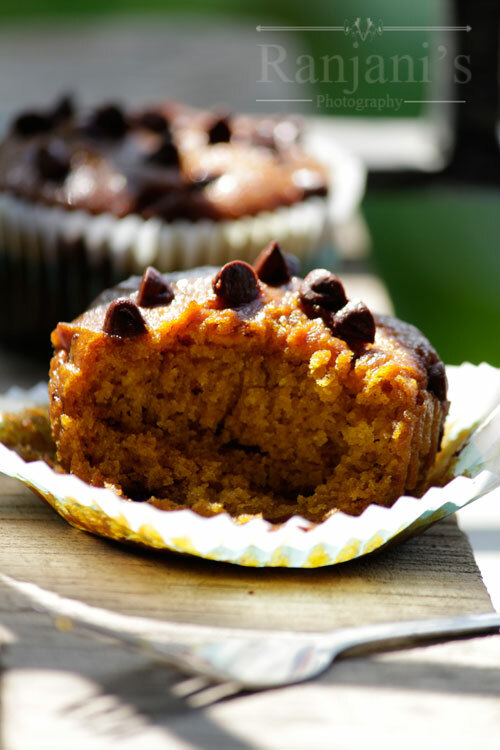 mango is a favorite fruit of ours… I love the idea of adding them to muffins! Such a fun idea to make muffins with mangos, they look perfect for breakfast! Wow, mango muffins sound heavenly. Your recipes sounds nice and simple too. Um, mango cupcakes? YUMMY! And how cool that you have a version without eggs! My friend is coming to visit next week and she is a big fan of mango. I may try these on her! Thank you Jeni 🙂 I am sure your friend will love it for sure.